→DeWalt DWS709 vs DWS780 | Which is Best ? DeWalt DWS709 vs DWS780 | Which is Best ? Wondering which to choose between the DeWalt DWS709 vs DWS780? ​Both are 12 inch double bevel sliding compound miter saws but there are a few subtle differences in both features and cutting capacity. Before we choose a winner lets have a quick review of each of the miter saws. Below we take a closer look at both of their features and then finally the comparison. 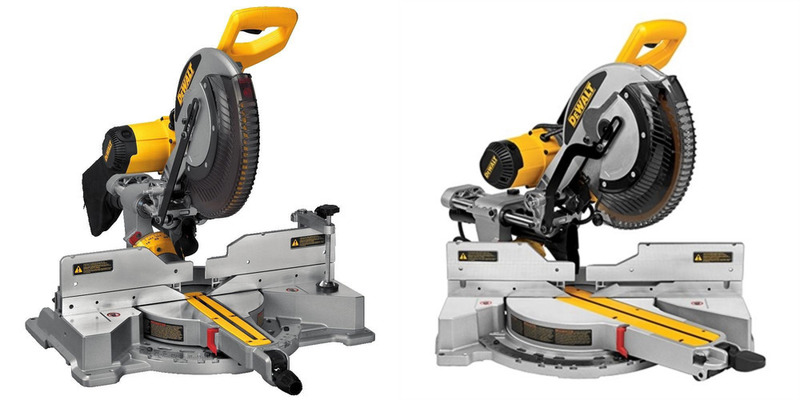 ​The DeWalt DWS709 is a 12 inch 15 Amp double bevel sliding compound miter saw. It has a miter range of 50 degrees for the left side and on the right side ​60 degrees. There are 13 positive miter detents throughout the range for quick cutting angle selection. If has the capacity to ​cut 9.5 inches at 90 degrees and 6-5/8 inches at 45 degrees. Included in the manual are instructions on how to increase the cutting to 14 inches for 90 degrees and 10 inches for 45 degrees. However, this setup is less than ideal for those who move from work site to work site. The DeWalt DWS780 is a double bevel sliding compound miter saw with a 12 inch blade. It is powered by a 15 Amp motor that gets the blade to a no-load maximum speed of 3800 RPM. ​It can make cuts up to 2x16 inch at an angle of 90 degrees and 2x12 inch at an angle of 45 degrees. The range of the miter adjustments are 60 degrees to the right and to the left 50 degrees. The DeWalt DWS780 comes with the XPS unlike the DWS709. XPS is ​DeWalt's cross-cut alignment system that is used to align the miter saws blade to where you have marked your cut line. XPS works by shining a LED along the surface of the blade. The blade casts a very clear shadow that is used as the guide. The shadow is so clear that you can even see the teeth of the blade on it. It is considered more reliable than a laser sight that may end up moving out of alignment over time especially if you are changing the blades regularly. The DWS780 is available in a significantly cheper variation called the DWS779. You can see how the two compare here DeWalt DWS779 vs ﻿DWS780​. DeWalt DWS709 vs DWS780 so which is the winner? Well the DWS709 if effectively the smaller brother to the DWS780. It has a smaller cross cutting capacity(unless you use a particular setup)​ and is the lighter built of the two. The DWS780 wins on cutting performance and also has the integrated XPS alignment system to help give more reliable and accurate cuts. If you are on a budget and you do not need a miter saw to be making large cuts regularly then the DWS709 is certainly up to the job. However, if you are a professional and need the bigger cutting capacity of the DWS780 then it is definitely worth the extra money.​ Paired with a high quality blade it is suitable for even fine woodworking and is certainly powerful and robust enough for a busy job site.